The Red Bull Arena in Leipzig, until 2010 called Zentralstadion, was built between 2000 and 2004 with the perspective of the upcoming 2006 World Cup. The stadium got built on the site of the old Zentralstadion, which was completely demolished with just the green outer banks remaining. The newly built arena opened in the summer of 2004. Total costs of the project had amounted to €90 million. During the 2006 World Cup, the stadium hosted four group matches and the round of 16 match between Argentina and Mexico (2-1). For a few years FC Sachsen Leipzig occupied the stadium, however poor attendances made them decide to move back to their old ground. With the take-over of SVV Markranstadt by Red Bull in 2010, the stadium found a new occupant in RB Leipzig. At about the same time Red Bull bought the naming rights of the stadium for a period of 30 years. With RB Leipzig’s increased successes on the pitch and strong attendances, Red Bull started to explore building a new more modern and larger club-owned stadium. However, the city of Leipzig preferred them to stay at the Zentralstadion and is currently talking with Red Bull about selling the stadium to them. Red Bull would then modernise and expand the stadium to a capacity of 57,000. The Red Bull Arena is one of three Red Bull Arenas in the world, with the other two being in Salzburg and New Jersey. 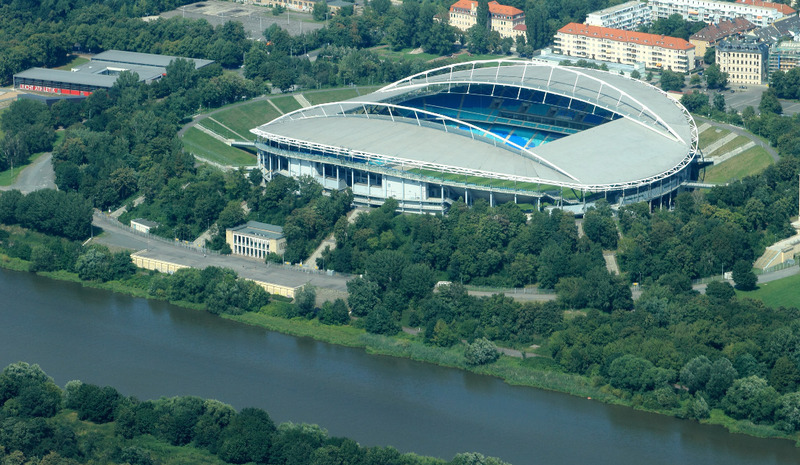 The Red Bull Arena lies slightly east of Leipzig’s city centre and central railway station. The 2-kilometre walk should not take longer than 20 to 30 minutes. Alternatively, you can take tram 3, 7, or 15 from the main railway station (Leipzig Hbf), which will bring you to the stadium in only 7 minutes. Get off at stop Sportforum. If arriving by car, take exit 17 Leipzig-West from the A9 (which runs west of the city). Follow the B181 in the direction of the city. After about 10 kilometres turn left onto the Rückmarsdorfer Straße. Follow (with a slight left onto the Hans-Driesch-Straße) until, after the bridge, you reach the stadium. 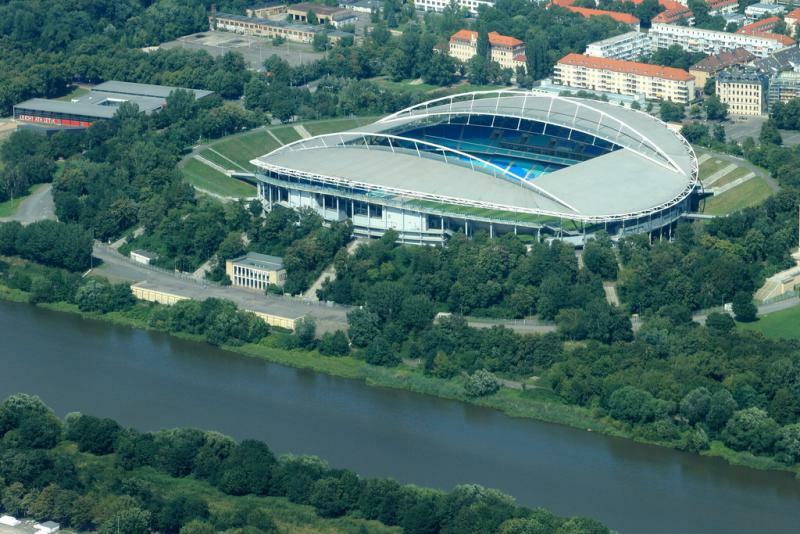 The Red Bull Arena Leipzig is located in a mainly residential area. You may find the odd bar or restaurant in the adjacent neighbourhood, but you can just as well eat and drink in the nearby city centre. Most bars can be found in the old town and south of the centre along the Karl-Liebknecht-Straße. Hotel Arena City Leipzig Mitte is the hotel located closest to the Red Bull Arena, but there are many more in Leipzig’s city centre, wich are all at reasonable walking distance. Tickets for RB Leipzig matches can be bought online (print@home), in person at the Red Bull Shop at the Neumarkt 29-33 in the city centre, or in person at Arena Ticket at Am Sportforum 2 near the Red Bull Arena. Tickets also tend to be available at the ticket windows of the stadium from two hours before the start of the match, though RB Leipzig have sold out nearly all matches since their promotion to the Bundesliga. Ticket prices depend on the opponent. Expect to pay from €15.00 for a seat behind the goal to €55.00 for a central seat at one of the sides for a typical match. Prices for the matches against high-profile opponents can get increased with up to €20.00. Redbulls.com – Official website of RB Leipzig. Sportforum-Leipzig.com – Official website of the Red Bull Arena. Leipzig.de – Leipzig tourist information. Lvb.de – Leipzig public transport information.